Welcome to Armand Cabrera Fine Art! Copyright © 2019	Armand Cabrera Fine Art. Reference Material: Bring small sketches or photographs you have shot yourself. Please do not bring photos that were shot by someone else. Brushes: I have switched to animal-friendly synthetic brushes for all my painting needs. Bring a maximum of 2 each. Turps: If you use turps, you must use Gamblin Gamsol. Because of allergies and other health issues, we cannot allow other mineral spirits or turps in the Studio. Other solvents are inferior and have an odor. 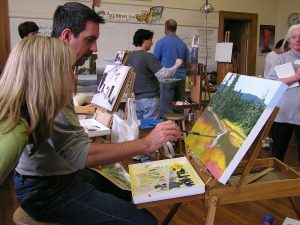 Tarp: Some venues require a tarp to protect the floors or tables for indoor classes…and if we must paint indoors due to bad weather. Sometimes a tarp is not required….so be sure to ask about this in advance. Tarps can be purchased inexpensively from hardware stores and other venues. No paper palettes. This is key to learning to mix color properly. Your palette should be made of glass, plastic or wood—not paper. Only paid students may attend the workshop. For the benefit of all paid participants—husbands, wives, pets, children, friends, etc. are not permitted to attend workshop. If you are physically challenged, please contact us so we can arrange for your caregiver to accompany you during the workshop. Copyright © 2019 Armand Cabrera Fine Art.